A couple of scientists from NASA and Columbia University developed a Google Earth visualization of a large database of global temperature data. They took data from NASA and other sources and mapped placemarks for cities all over the world. Download their global data file here [Google Earth File. You must have GE installed.] (it may take a few seconds to load the thousands of datapoints). 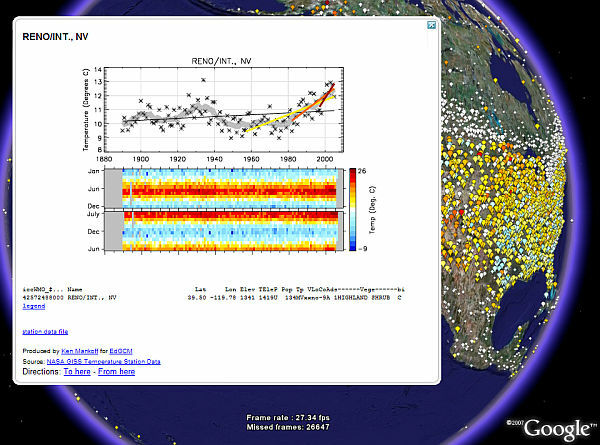 The placemarks have colors which shows the warming trend between the baseline years and recent years. White represents pins without sufficient data in the baseline or recent years. The amount of cooling is shown in shades of blue and amount of warming in reds. But, the real interesting data is inside the placemark descriptions where graphs are shown indicating the temperature trends for each location over the past century or more. The collection was put together by Ken Mankoff of NASA, and Mark Chandler of Columbia University. There are more intricacies to the display of the data which are explained on their web page here. This project is a part of a bigger project they have been working on called Educational Global Climate Modeling. This site has a lot of interesting information about our global climate.